My involvement with eczema began many years ago when I observed that the quality of life of many asthmatics was destroyed more by their eczema than their asthma. When I became interested in food as a cause of asthma I found that when a restricted diet had improved the asthma, sometimes the eczema got better as well. These were patients had also been attending the skin clinic for years, so when there had been a remarkable improvement in the eczema I enquired if their improvement had been commented on by the Dermatologist. To my surprise their improvement had never been commented on or excited any curiosity, so I became deeply interested in eczema as another aspect of allergy. 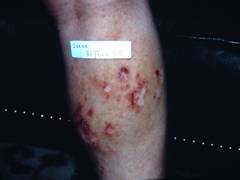 A study of old allergy journals and textbooks, mostly American, revealed much research into finding causes for eczema at a time when there was no effective medication. These efforts had declined considerably after effective steroid creams were introduced and it became no longer necessary to look for the cause and avoid it.. It is difficult to understand why British skin specialists often refuse to carry out prick skin tests when requested, yet routinely carry out many ‘patch tests’ to identify contact allergens. Localised allergy in skin cells is a characteristic of allergy to nickel and many other chemicals, where prolonged exposure is necessary to produce a reaction, therefore patch tests stay in place for two days to produce slow reactions. Inhalant allergens such as dust mites and some food extracts have been used as patch tests as well as prick tests in Europe, and produce reactions of clinical significance. As far as I am aware the allergy patch test has not been used to any extent in this country. Unfortunately GPs are programmed to refer all eczema cases to the skin department, so it is only a very persistent patient or parent who will succeed in having the allergic possibilities of eczema investigated. 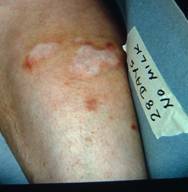 My experience has been mainly when eczema has been another part of the problem.. How significant my personal approach to the eczema problem would be if applied in an average dermatology clinic is quite unknown.. The highest readings for IgE antibodies are to be found in eczema, yet these immunological results, if they are carried out at all, are usually rejected by dermatologists as unimportant or misleading, perhaps because they are not be understood. In Europe and the USA the attitude of many dermatologists is quite different, and the importance of foods and inhalant allergens such as dust mite or animals in causing eczema is fully acknowledged, investigated, and treated.. Recent studies from USA, Australia, and New Zealand have confirmed that foods play a very dominant role in the causation of infantile eczema. 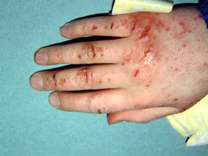 When foods cause eczema the reaction is usually slow. Traces of the food are absorbed into the blood without causing a local reaction in the gut, and pass in the blood and then the tissue fluids to produce eczema in the sensitised skin. The same mechanism operates when the joints, brain, kidney, or any other organ system has become sensitised. 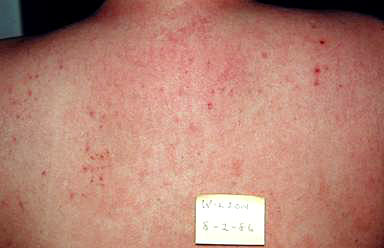 It is often very difficult to help eczema sufferers because there are often not one but several causes. This means that unless they are all eliminated simultaneously the eczema will not improve. Avoiding single foods such as milk will only help if milk is the sole cause, and to exclude one major food in turn risks missing the other foods, and several foods taken together may have additive effects. Inhalants such as dust mites and pets are often involved as well as foods, but without skin tests, which many dermatologists will not do, the importance of the environment is seldom recognised. 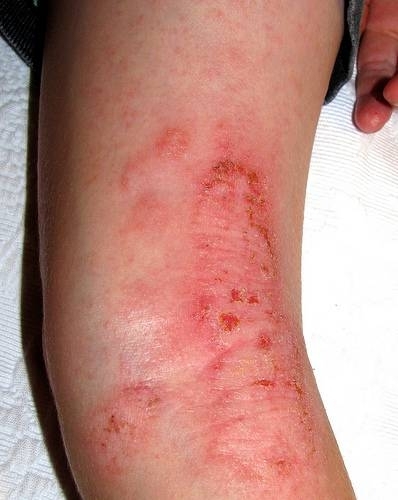 If the eczema is allowed to persist for years repeated infections of eczematous skin often result in the formation of specific IgE antibodies to bacteria such as the staphylococcus, thus making recovery even more difficult because bacteria are normally found on skin. Scratching causes loss of sleep, infection is common even when the nails are kept short, cracks on the hands are very painful and limit exertion and games, victims are teased and bullied at school and regarded as outcasts because they look infectious and dirty. Eczematous children put up with a great deal, and sometimes suffer all their lives. Thus there are many good reasons to investigate eczematous children for avoidable causes in the food and in the environment at as early an age as possible, rather than just put up with it somehow and wait for it to get better, and if it does very likely to change to asthma and rhinitis. I will now mention a number of cases where I have photographic evidence before and after the cause had been identified and avoided successfully. How many others could be successfully treated and even cured by using similar methods considering that eczema is seldom referred to an allergist? 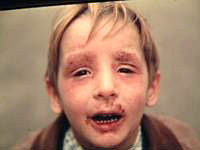 The eczema of the eyebrows and eyelids is seen quite often when dust mites are involved in the cause. The rash round the mouth suggests that a food is involved, and the mouth is wide open because his nose is blocked by allergic rhinitis. 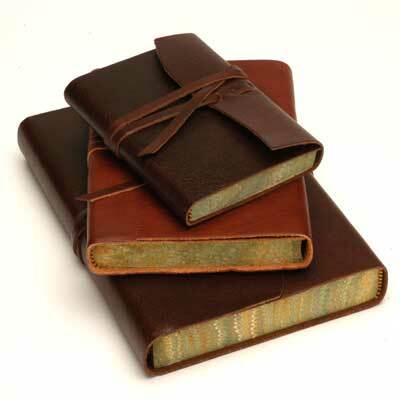 I have seen one-sided eczema due to contact with the pillow and sleeping always on one side. Sylvia was aged forty-one, and had had severe eczema for 14 years. 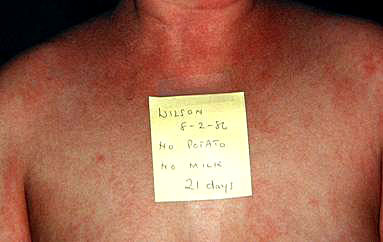 A dermatologist had tried many treatments in vain. On one occasion she was worse on holiday in Spain, but better on a cruise for two weeks. For some time she had noticed that contact with cheese would cause intense itching and tiny blisters under the skin, and that she had a very similar reaction to handling raw beef so that she had to wear rubber gloves. This observation clearly indicated milk and beef as significant causes Questioned about her diet on holiday and on the cruise revealed that she had had no milk on the cruise, and dried milk in Spain. Skin testing was negative and blood tests gave a Total IgE of over ten times normal, but negative for milk and egg. The eczema was worst on the legs and elbows, where the skin was very inflamed and thickened, but with total avoidance of all milk products her skin cleared completely in a year or two, as shown below. Nine years later she was seen again with severe eczema of the face for three years for which she was having frequent courses of oral steroids under the supervision of the Skin Department and was rapidly becoming steroid dependent with characteristic side-effects. She had been referred to the skin department again In spite of the excellent result ten years before, so she insisted on an allergy investigation. The skin test for egg was very positive, and she had been able to tolerate milk for some time without effects. Total IgE was only three times normal this time, and negative for egg. However, complete exclusion of egg and chicken resulted in complete cure and she did not require steroid creams or tablets any more. This was, of course an example of changing allergens which may be quite rare, and also illustrates how blood tests can be misleading. 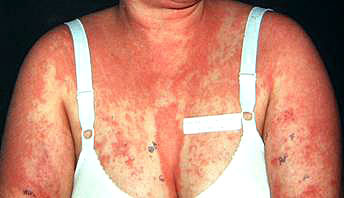 Linda was first seen aged forty, and came from a family with many allergy sufferers on both sides. She had a history suggestive of milk allergy as she been breast fed to eight months, and eczema began when she began taking cow’s milk formula. Eczema had been her major problem until about two years before, when the asthma became life-threatening and she had had a spell in hospital. She had been intermittently dependent on oral steroids for the previous seven years. 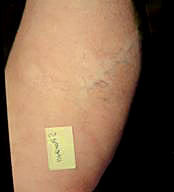 When seen she had such extensive eczema so that it was difficult to find a clear space to do a skin test. There was a big skin reaction to dust mite, and slight positive for dog and cat, which she already knew affected her. The main finding was that she had very large reactions to the major milk proteins, beef, to raw milk as a prick test, and a very large reaction to potato juice. She had noted that handling or peeling potatoes caused itching of the hands. Her asthma was severe, with a Peak Flow of only 210, but the blood tests were more useful this time, as she was very positive for the major milk proteins, but negative for potato. Total IgE was over ten times normal. After three weeks on a diet excluding the solanacae ( potato, tomato, tobacco, etc) and all milk products the appearance was as illustrated below. She was much improved as far as the eczema was concerned, but her Peak flow rates were still low, probably due to the dust mite allergy as the major cause of her asthma. Further investigation was impossible as she was moving north..
Eczema or urticaria on contact with spilt milk is clear indication that milk is the cause, but this is rare. To prove the link with milk is often unsuccessful because of the unsuspected role of environmental allergens and other foods.. For example John had very severe eczema which improved to some extent on milk avoidance, but never cleared completely except on holiday in Spain. His eczema had cleared completely on holiday, but on the way home from the airport the family dog was picked up from the boarding kennels, and by the time he reached home an hour later he was scratching himself to pieces. 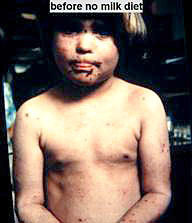 The dog was found a good home and he had no further eczema as long as he avoided milk. It is notable that he was so sensitive to the dog that the effects of one hour’s close contact in the car lasted for days. The moral of this tale is that eczema can have several causes. 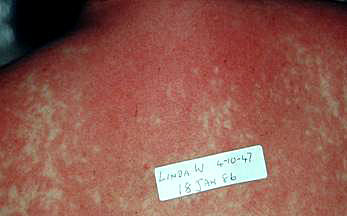 The houses of aged relatives which are often infested with dust mites can produce similar scenarios in cases where dust mites are a major cause of the eczema or asthma. There was no way she could avoid dogs and cats completely, so she was carefully desensitised in hospital, a procedure which would be impossible today, and her immunity was shown by no effect from playing with the dog all morning before discharge, as shown.